3 Ask yourself, is it worth the sacrifice? 8 What do others think about it? Being a control freak changes your life in all sorts of ways and has the potential to bring a negative impact on all your relationships. If you’re wondering how to stop being controlling, that is a very good first step in the right direction. Since how to stop being controlling is about mental health and balance, finding ways to overcome this tendency can help you build more meaningful relationships and closer friendships with those around you. You probably were an overachiever as a kid and so you are a perfectionist in adulthood. But think about it, is it really fair, or even realistic to hold everyone to the same standards you set for yourself? Others may not be as obsessed with perfection as you are. If you care about them enough, you would not expose them to the same pressure you place on your own shoulders. How to stop being controlling is really about understanding other people’s limitations and desires, and accepting that sometimes, the enemy is you. Admit you are part of the problem and not part of the solution, with your controlling behavior. Perfectionists and those in exaggerated need of control are often exposed to generalized anxiety and panic attacks. It often happens that a minor thing goes wrong and it is enough to ruin your mood for the day. Sometimes that minor thing throws you into a tail spin of guilt and worry about the future. Ask yourself, is it really worth it or are you blowing things out of proportion? Being controlling may have its small advantages in the short term. However, how things pan out in the long run is most likely to be influenced only in a small measure by perfection at every step of the way. Ask yourself, is it worth the sacrifice? As a control freak, you strive to meet deadlines and deliver perfection. You never lose keys and you get everything done on time. But sometimes there are more ways to achieve the same result. Sometimes, someone you work with may do things just as well as you, but in a different way. Your need for control will prevent you from enjoying the result, only because it was achieved in a different way than you wanted. Is your ambition worth sacrificing your wellbeing? The thought processes that push your controlling side to the surface are always based on insinuation, and lack a logical foundation. The need for control is superficially motivated by imagined consequences and projections like “if I miss this deadline by a day, then I might lose this customer”. These ideas hold because they usually go unchallenged. Asking yourself if this thought actually reflects the reality will often yield a negative answer. These half formed ideas insinuate themselves into your thought process and play with your fears rather than being grounded in reality. Analyzing them on a regular basis is difficult because it requires changing your relation with reality, but well worth in the long run. How do you know that the worst outcome will happen, is there any evidence? The burden of control freaks is that they think they are responsible for everything. Conversely, the world should revolve around them. But the world does what the world wants and the control freaks are left with no reward, while being toppled by self-imposed responsibility. Realizing you are not God is the best how to stop being controlling tip out there. This is going to be really hard to do, because it asks going against your nature. Let someone else take the responsibility for planning the trip or take the kids to school. Learning to trust others will help you trust yourself better. Say they fail the job; ask yourself, what is the absolute worst thing that came out of that failure? Was your schedule ruined for the whole day? So what? Is that really a catastrophe? Chances are failure can happen anyway for reasons beyond your control. Before the next weekend comes, just don’t make any plans for it. Promise yourself that you will wake up on Saturday morning and you will do whatever comes to your mind first. Walk around the city without having a goal and without needing to get anywhere. It will make you feel relaxed like when you were a little kid without a care in the world. Or take a spontaneity lesson in improvisation classes. If your inner control freak is forbidding your kid to invite friends over for fear of chaos and untidiness, then you’re obviously crossing the line. You are way more likely to be frowned upon for not allowing your kid to have a life than for having a slightly messy living room. There are a few families of emotions that can drive you. Some of them are good, like love, and some of them trigger stress, life fear. 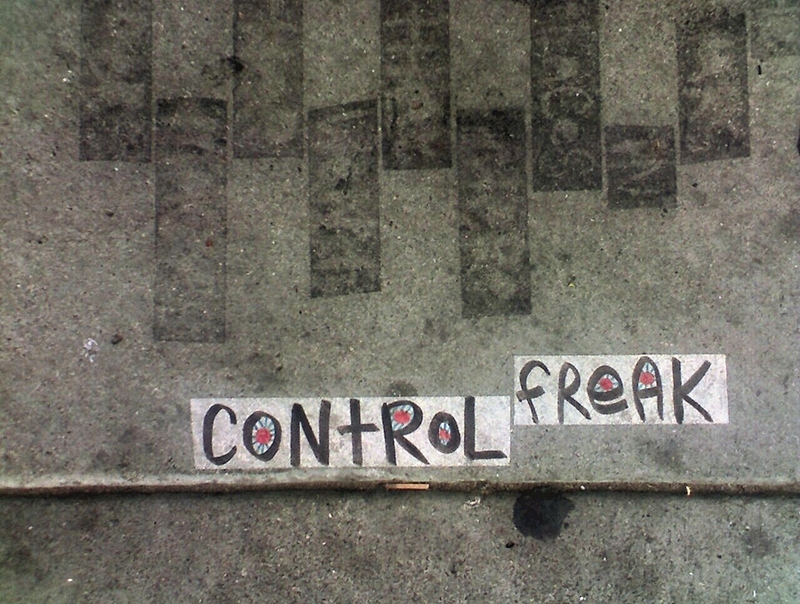 Control freaks usually are driven by fear. Fear of the future, fear that things won’t pan out right in the end. Understanding what drives you is the key for distancing yourself from your own fear and stress. Looking at yourself from some inner distance can help you distance yourself from the negative emotions that drive your behavior. Moreover, it will help you recognize all the adverse impacts of your feelings. Careful and permanent self-observation is just one step away from mindfulness, a method to relieve stress.